The Porfiriato offered equally pretentious government buildings, in this case one designed by Silvio Contri for the Ministry of Communications and Public Works. Completed in 1911, it was inaugurated by Madero, Díaz's successor. 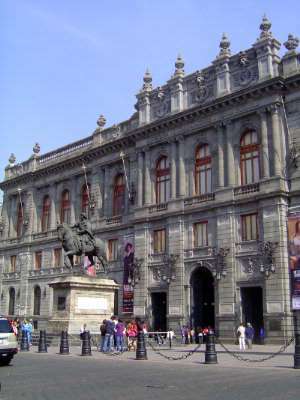 Since 1982 it has housed the National Art Museum. The equestrian statue of Charles IV is much earlier and is the work of Manuel Tolsá. Spain, however, was soon to become a satellite of France, and a plaque on the statue's base seems to reflect contempt for a weak king, or perhaps merely anti-Spanish sentiment. Dismissively, it states that "Mexico preserves it as a monument of art."